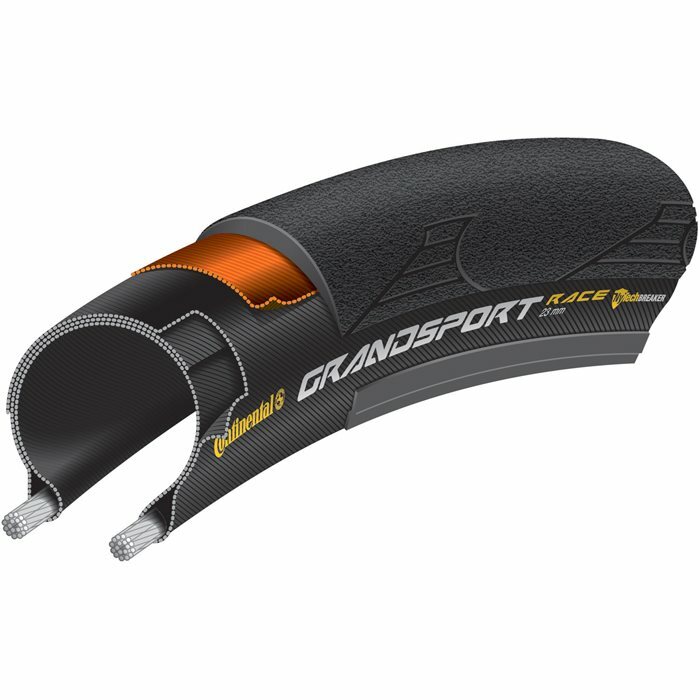 High performance race bike tyre – Grand Sport Race – designed to cater for Sportive use. Chosen as a fitment tyre with many top bicycle manufacturers & introducing the new PUREGRIP compound, sitting just below BlackChili but comparable with any other compound on the market. I only made 100km with them in dry weather (temp 5C-10C) and all I can say is they are comfortable (28mm) and for now it looks like they are tough-a lot of stones on the road and even pieces of glass. Grip is solid. These tyres have good comfort, grip & are fast rolling. Only 120 miles so far, seems they will last a good number of miles before needing replacement. This is my third set of these tyres......ideal for the milage I do..... only one puncture in the past three years.......would recommend these tyres for any one doing 3-4 rides a week. These are great training tires. They are built to with stand the elements of the road. Cheap, quality tyres, last set I had managed about 15000km so I can't complain. Great solid tires. Durable, puncture resistant, smooth rolling, 25 mm is a little extra cushion, wear forever - got nearly 2K on the rear tire before it had to go. Nothing flashy but great value for sure! Purchased as replacement tyre, gives good grip and puncture resistance. Excellent service delivery by Merlin. Great tires for the price. I have been riding these every day and they are super smooth and haven't had issues with my tubes. My second time with these tyres and I only replaced the original ones after 3500miles due to the number of cuts from the flint shards in our area. These tyres get some serious commuting abuse in all weathers and with some light off-road track use thrown in for good measure. The old tyres were 28mm and still had plenty of tread left, despite the flint cuts. I decided to try out the 25mm versions this time and they appear just as durable and in their new state are resisting the flint cuts so far. A great tyre, very durable and grippy and relatively light. Highly recommended for all season riding. Excellent tire. I feel like I`m riding tubulars. I definitely recommend. Never disappointed with Continental quality and performance, I was moved to purchase these two tires for the brand and the price. They are mounted on my TT/Triathlon race wheels and will see service in the future. While usually going for 200 grams +/- in a tire for these wheels, 250 grams with the added flat protection is a good trade off in my opinion, because the courses are rarely hilly and the time to change a flat is a race killer. Bottom line, provisional "thumbs up." A great all rounder tyre.